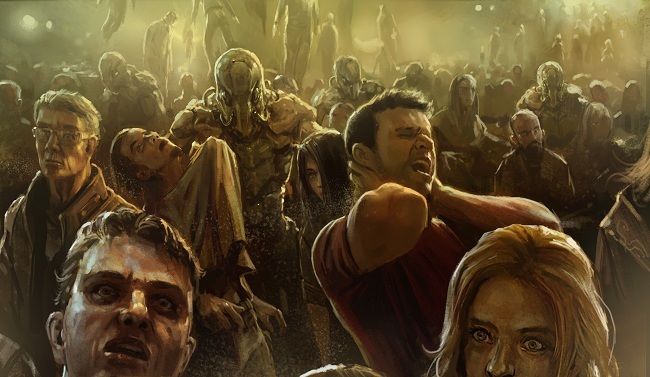 Before the victims below could understand what was happening, the nanites had already passed through the outer layer of skin, navigated the bloodstream, and attached themselves to the base of their spinal cords. When enough of the insidious little things had amassed in a single person, they begin to emit rhythmic electrical pulses ― not enough to disrupt higher brain functions, but more than enough to overpower the simple neural pathways below the neck. People screamed and shouted, struggled in vain, and cried pitifully for help, but their bodies wouldn’t respond. They walked out into the green tinted glare of wide-angle tractor beams, which lifted them off the ground by the thousands. Their bodies tumbled slowly, out of control, up into the waiting dropships. But then the dark sky lit up with different colors. Sparkling blue explosions and brilliant red contrails streaked across the night. The capsuleers had arrived. Arriving sporadically at first, then in greater numbers and with more organization, they warped onto the battlefield in high orbit above the planet and opened fire with reckless voracity. Their ships’ advanced electronics systems and powerful defensive measures shrugged off the Nation’s viral broadcast, allowing them to unleash a hail of guided missiles, artillery slugs, and incorruptible attack drones. They punished the Sansha vessels with their assault, but suffered a coordinated counterattack as the invading fleet systematically chose one target at a time, focusing all of its considerable firepower against the unfortunate subject. Sensing the imminent danger to their ground operation, the dropships began to lift off of the surface all at once, not quite full yet, taking tens of thousands of citizens with them. They rocketed back up through the atmosphere on solid fuel jets, back to the safety of the wormhole. Stray weapons fire from both sides caused more than a few of them to explode, get knocked hopelessly off course, or suffer hull breaches, sending thousands of paralyzed humans spiraling out into space. For over an hour the battle raged, until the intervening void was clouded with dissipating particulate matter, the twisted wreckage of starships, and the corpses of those who had once crewed them. By that time, capsuleers had gained the upper hand, their resilient starships taking on many times their number of antiquated Sansha battleships. The wormhole pulsed once more, sending static through every local starship’s sensors. When scanners came back online and searched for targets, a new contact had arrived: The massive carrier was shrouded in a layer of projected energy shielding so thick that one could barely see the heavy armor plates beneath. The fighter bays along the monstrosity’s hull were closed, for it had no intention of launching any. Instead, its supplemental capacitors spun to life, sizzling with an overabundance of power as relay switches connected them directly to the built-in shield emitters. The field created was far more powerful than a normal shield but highly unstable. That was the point. A tremendous blast of energy spread out in a spherical pattern, physically pushing ships away with the crushing force of charged gravitons. Attack drones simply evaporated as the weapon, designed to cause significant damage to much larger ships, reduced them to glittering pieces of superheated metal. Smaller capsuleer ships survived one or two bursts, perhaps, but by the time five waves had passed, everything smaller than a cruiser had disintegrated. The capsuleers adapted to the situation quickly, though, adjusting their trajectories and cycling new ammunition into their weapons. Mere seconds after it had arrived, the carrier was inundated with a withering barrage of destruction. Scorching laser fire, armor piercing projectiles, tactical warheads, and superheated plasma bolts rained down until even its remarkably powerful shield system was spent. It listed awkwardly in space after losing control, but only for a few seconds before the relentless capsuleers closed in to finish the kill. After a few moments of smaller explosions tearing apart individual segments of its hull, the Sansha carrier’s thermonuclear generator released a blinding flash of light, incinerating the entire internal structure of the ship and leaving nothing but a charred husk of superstructure behind, slowly spinning as pieces continued to break off and drift away. Unable to sustain a viable signal with the flagship destroyed, the wormhole wavered slightly, then vanished, abruptly ending the communications static and returning the system to a tentative state of normalcy. The invasion had ended, but the war was long from over. The capsuleers who weren’t busy salvaging the wreckage or attacking one another over the right to do so warped away one at a time or in small groups. They didn’t know when or where Sansha would strike next, but they knew that, with each empire’s defenses caught off guard and rendered all but unable to respond, they were New Eden’s only hope for a sustainable defense.